If you want to get rid of Subscribe to Posts (Atom) link from Blogger template, then you are reading the right article. many blogger templates come with the old Subscribe to Posts (Atom) feature which shows the link below your post navigation links. there two easy methods to remove this link from your blogger template. 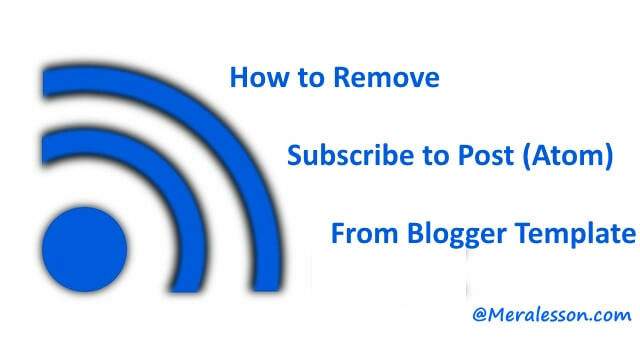 So in this Blogger tutorial you will learn how to remove subscribed to Posts (Atom) in blogger blog. What is Subscribe to Post (Atom)? Well, Blogger provides atom feeds, which allows readers to get receive automatic updates from the blog like an RSS feed. Nowadays everyone using RSS feeds to get updates from websites. An RSS feed is easy to understand almost every website using RSS feeds to provide updates. The first you need to do is go to your blogger template search for "" tag. After you are done, then you need to copy below CSS codes and paste it just above the "</b:skin>" tag and save the template. So this CSS code will hide the Subscribe to Post (Atom) Link from your blogger template. To permanently remove the Subscribe to Post (Atom) Link from your blog. You need to go to your blogger >> Template >> HTML and search for "<b:include data='feedLinks' name='feedLinksBody'/>" tag using the search box (Press Ctrl+F) and deletes the source code and save the template. Now you have successfully removed the Subscribe to Posts (Atom) Link from your blog and you will never see this again. That's it, We hope this tutorial may help you to remove the post feed links from your blogger template. If this tutorial helped you and you learned from it, then make sure to like and follow us on Twitter, Facebook.